Triple K Cooperative was a First Nations screen print publishing company. The Triple K Cooperative was set up in 1973 in Red Lake, Ontario by Josh and Henry Kakegamic along with their father David and their brother Goyce. It was the first native silk-screening production company in Canada. The idea was conceived by Josh Kakegamic who wanted to maintain artistic control over his work. He and other Red Lake artists inspired by Norval Morrisseau had also found that the costs involved in contract printing were inhibiting. Distance was a factor. Red Lake is a gold mining town 100 air miles north of Kenora and 180 air miles east of Winnipeg. It was a daunting task for Triple K to learn and master the skills needed to gain serious recognition by the art industry. Distribution, commission structures, art gallery/artist responsibilities and copyright were all unfamiliar topics. In the beginning the print shop produced a number of unlimited reproductions on cloth and paper, chiefly by brothers Joshim and Goyce, but gradually the Co-op reassessed its approach to printing and its role in the artist/printer relationship. Because of the growing reputations of some of the artists involved, and particularly because they had begun printing works by Norval Morrisseau, Triple K Cooperative began printing only original limited edition prints. In the area of silk screening, the term original prints needs explanation. The silk screen prints at Triple K were made from drawings specifically designated for the silk screen process by the artist who stipulated all the colours in the design and was involved during the critical stages of the process. A single proof was printed and submitted to the artist for approval. If accepted the artist would sign and date the proof. If not the initial process was repeated incorporating the changes desired by the artist until finally the bon a tirer was approved. It was signed by the artist and then the entire edition was printed, signed and numbered by the artist. No further prints were ever made of that image. 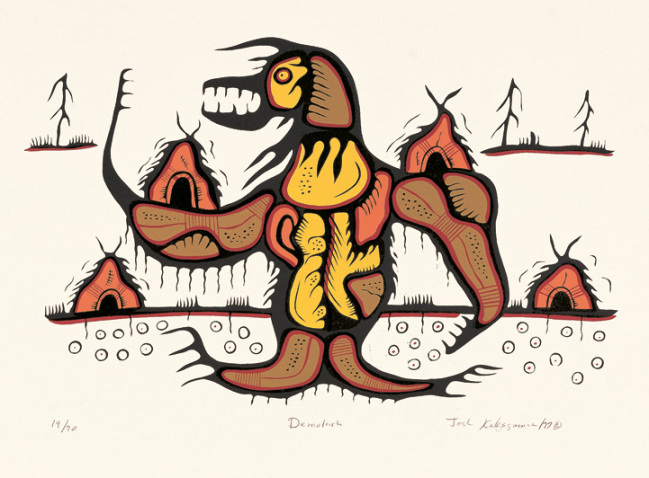 By 1975 the lack of contractual safeguards meant that work by many native artists was being reproduced without the artist's consent and without specific royalty arrangements. The Triple K Cooperative retained the services of a copyright lawyer and were able to resolve many disputes, most to the benefit of the artist. Distribution of the prints was a trial and error process for the first eighteen months that the Co-op was in business. Eventually they made an agreement with Roy Maxwell, a man of integrity whose experience and extensive knowledge of the Canadian art market allowed the Co-op's prints to be distributed to approximately fifty galleries across the country. The distribution further enhanced the reputations of Co-op members and gave younger artists opportunities normally not available in isolated communities. Recognition often led to enquiries about other works by the artists and often direct contacts and gallery shows. The Royal Ontario Museum held an exhibition in 1977 entitled Contemporary Native Art of Canada - Silk Screens from the Triple K Co-operative, Red Lake, Ontario. The Triple K Cooperative closed its doors in 1980. But works by artists that had been supported by the coop can still be found at auction or via galleries like Wahsa that specializes in Woodland Art.